This watercolour by T.M. 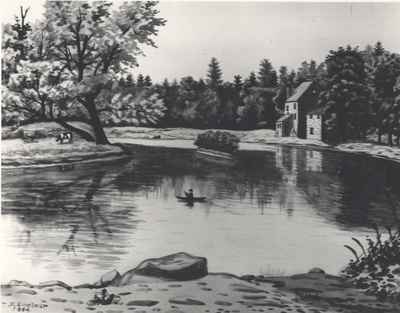 Sinclair in 1904 depicts the Chisholm Mill which was built in 1827. No known photos exist of the mill. The mill was one of William Chisholm's original projects. An earlier warehouse had been built on this site at the end of Robinson Street in 1836. Grain dealers Romain & McDougald built this stone warehouse in 1855 using limestone ballast from lake schooners and stone from the lake bottom raised by "stone hookers." Internally, massive timbers support the floors. 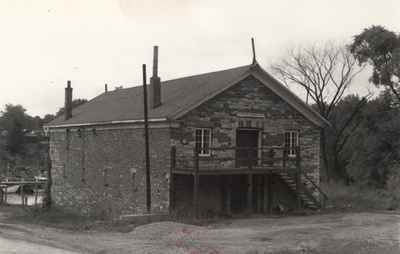 The Granary is the only Ontario stone warehouse of its type still standing on its original site. It was renovated circa 1990 and converted to office use. 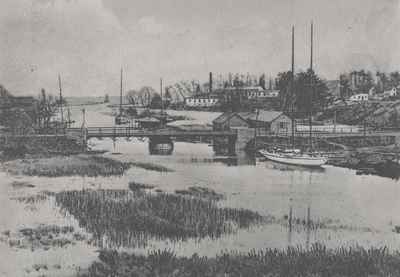 1906 Postcard entitled 'High Water' looks South West at the Radial Bridge, harbour and swamps. 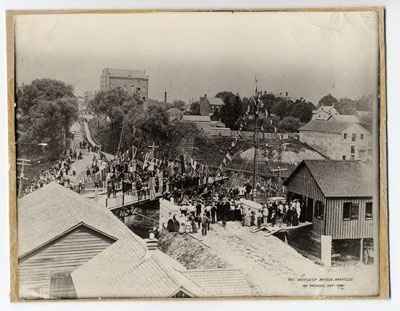 Also visible are the houses on West bank, Sixteen Mile Creek from North of radial bridge, the Aberdeen Swing Bridge, Tannery and Lighthouse.